In the present time where affordable condo units are in demand for salaried workers, the greatest challenge that home makers are facing is making the most of their space at home. Most condo units and apartments have limited spaces so it is necessary that we know how to maximize the area. If you have two kids at home, they both probably need a study or a working area where they could maintain some kind of privacy and their own distinct space. The above design would be great for two kids or even a Mom and a kid tandem. It is actually a piece of table which was divided into two separate working areas using open shelves. Nice idea, isn't it? It is not costly either. I think it would be better if you will have it customized by your favorite handyman. You can choose a color motif your kids would prefer. 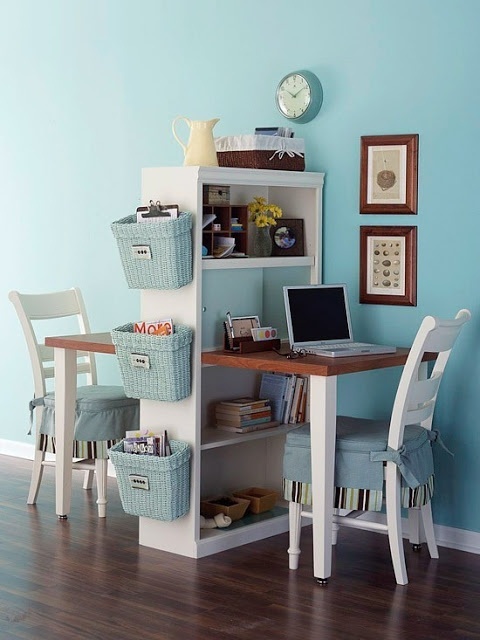 Try this at home for a clutter free space that's both simple and functional.